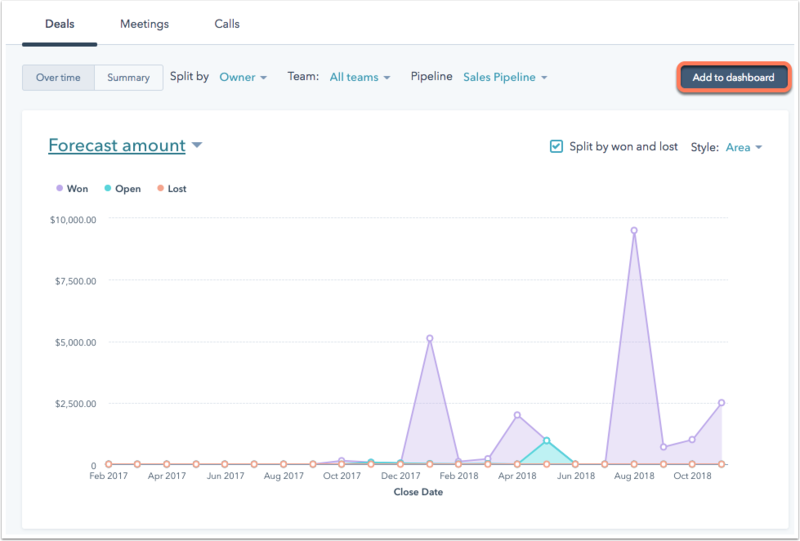 Depending on your HubSpot subscription, you can track your team's performance using the default productivity report on your sales dashboard or using the sales team and service team productivity reports in your analytics tools. This report counts the number of calls placed, emails sent from the CRM, emails logged in the CRM using the BCC to CRM address, emails logged as activities on a contact's record, meetings held, notes created, tasks due during the timeframe, and user(s) selected. At the top of the dashboard, use the dropdown menus to filter by team member and timeframe. In the Productivity report, hover over one of the statistics and click Quick view to see a list of the specific activities in that category. Please note: if there has been no activity in one of these categories (call, email, meeting, note, or task) during the selected timeframe, the category will not appear in the Productivity report. If you're a Sales Hub Professional or Enterprise user or a Service Hub Professional or Enterprise user, you can use the team productivity reports in your account's analytics tools to track your team's performance. 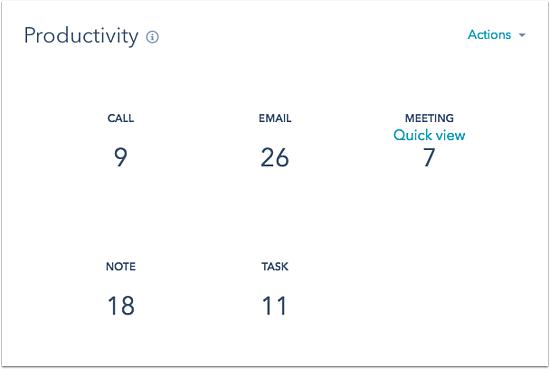 In the sales team productivity report, track your sales team's performance across deals, meetings, and calls. In the upper left, use the Date range and Frequency dropdown menus to filter your data for a particular time period. When the date range selected consists of a week, or when the frequency is set to Weekly, the default starting day is Sunday. Use the Team and Pipeline dropdown menus to drill down into a specific team or pipeline's metrics. Click the Split by dropdown menu to see the data split by owner or team. 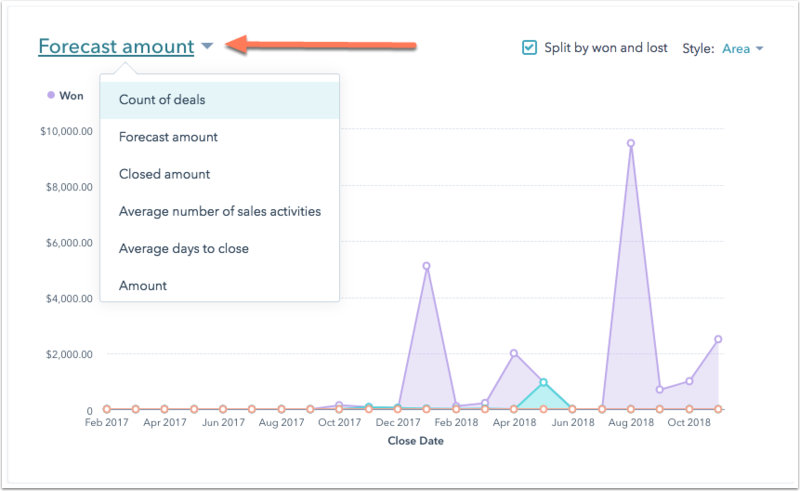 On the chart visualization, select the Split by won and lost checkbox to see a breakdown of deals that were closed won or closed lost during the specified time range. On the Meetings and Calls tabs, use the Team dropdown menu to filter the count of meetings booked or calls made by a specific team. In the service team productivity report, you can report on your service team's performance across tickets. In the upper left, use the Date range and Frequency dropdown menus to filter your data for a particular time period. Use the Team and Pipeline dropdown menu to drill down into a specific team or pipeline's metrics. Both the sales team productivity report and the service team productivity report can be added to your dashboard and shared with your other team members. In the top right of the report, click Add to dashboard. In the top right of the data breakdown table, click Edit columns to edit which metrics are displayed. Select the checkbox next to the metric to include, then click Save.